The HyperMac brand recently added connectors to its batteries to allow users to charge their iPads through Apple’s 30-pin connector, so the same battery can service both your MacBook and your other Apple portable devices. Apple sued Sanho Corporation, HyperMac’s parent company, in early September, alleging violations of Apple’s MagSafe and 30-pin iPod connector patents. 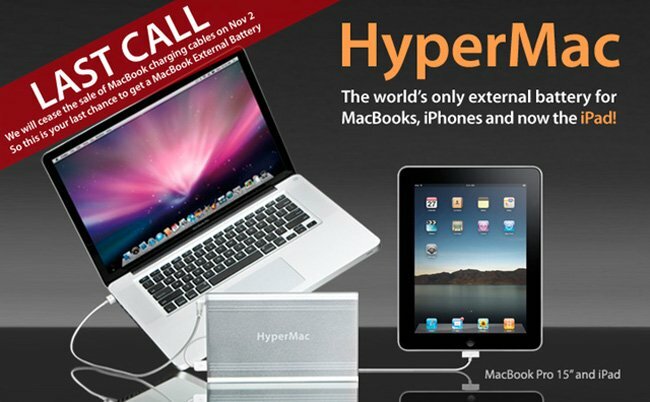 The lawsuit resulted from HyperMac’s popular line of batteries that could charge any MacBook or MacBook Pro, or an iOS device with the 30-pin connector. If you are thinking of purchasing a HyparMac external power supply now could be a very good time to invest in one.